The refreshments you provide your clients and for your staff should reflect your company values. Make sure you show off your quality by offering potential clients a delicious cup of coffee when they arrive. Look after your staff and their wellbeing by keeping them refreshed with cold, filtered water at all times. Create efficiency by installing a water boiler which reduces all the time that is wasted waiting for the kettle to boil. Show you care by providing ethical and sustainable coffee and consumables. Get in touch with us today to discuss how we can help you make a fantastic impression for the best price, or browse a few of the products we offer below. You can't serve your clients or your staff sub par coffee. A fantastic coffee machine is a must have, whether it is in your reception area to impress clients on arrival, in your boardroom for important meetings, or in your busy staffroom. Fresh, filtered and cool water at the touch of a button is a necessity in any workplace. That means watercoolers are essential. No longer bulky or ugly, browse our range of sophisticated and discreet watercoolers to compliment any environment. Boiling water for teas and coffee at the touch of a button? Yes please! Think of the amount of time that is wasted in your working environment by people waiting for the kettle to boil. 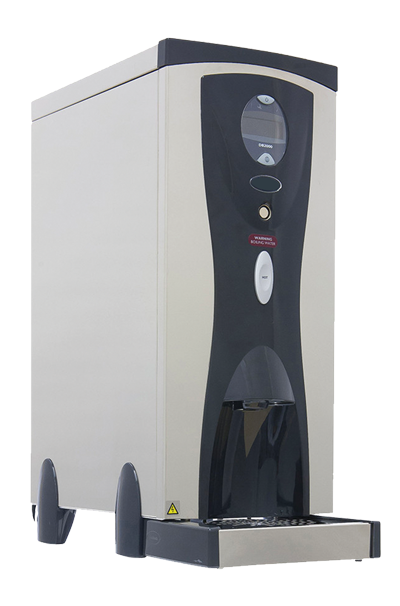 Increase efficiency by getting a plumbed-in water boiler. The Control-Flow is a fob-operated water boiler with an advanced programmable locking system, ensuring protection in environments where health and safety is of the utmost importance. Copyright All Rights Reserved © 2018 | Website & Digital Marketing by Embryo Digital.